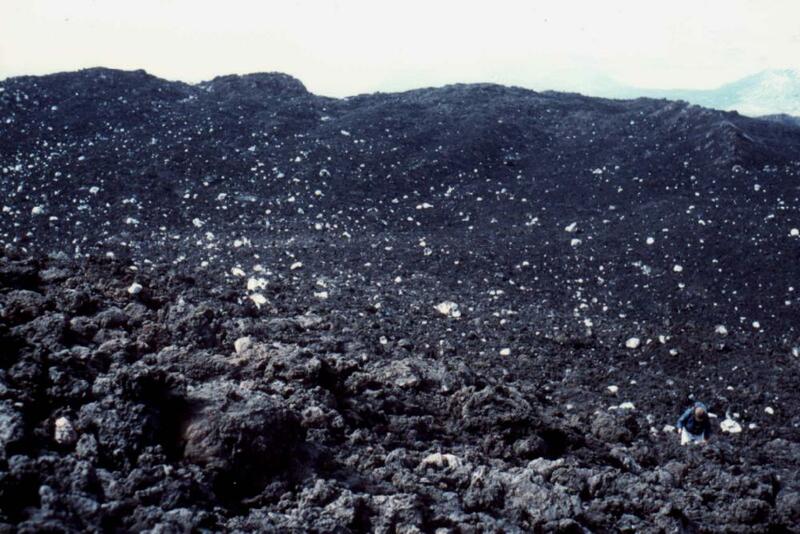 Panoramic view of the upper W flank of Etna, with numerous dark lava flows that were emplaced between 17 October and the day the photo was taken, 29 October 1999. 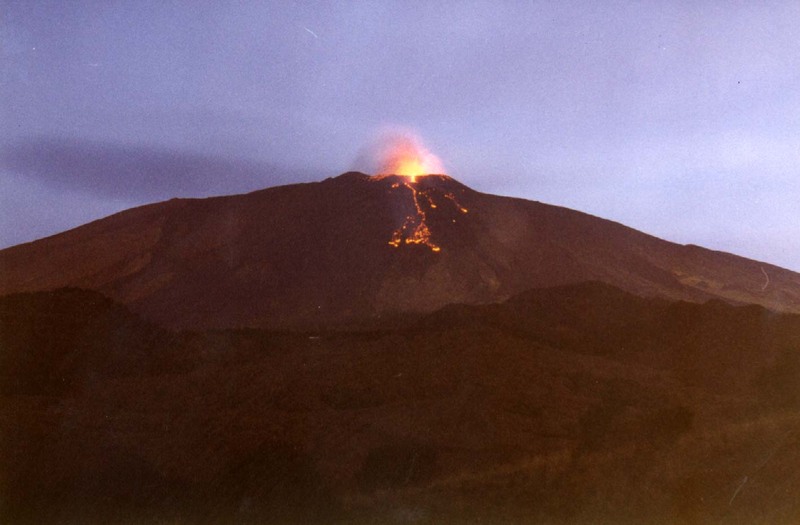 The longest flows extend beyond the margin of the photo at lower left, while most other flows stopped at about 2000 m elevation, before reaching the forest limit. 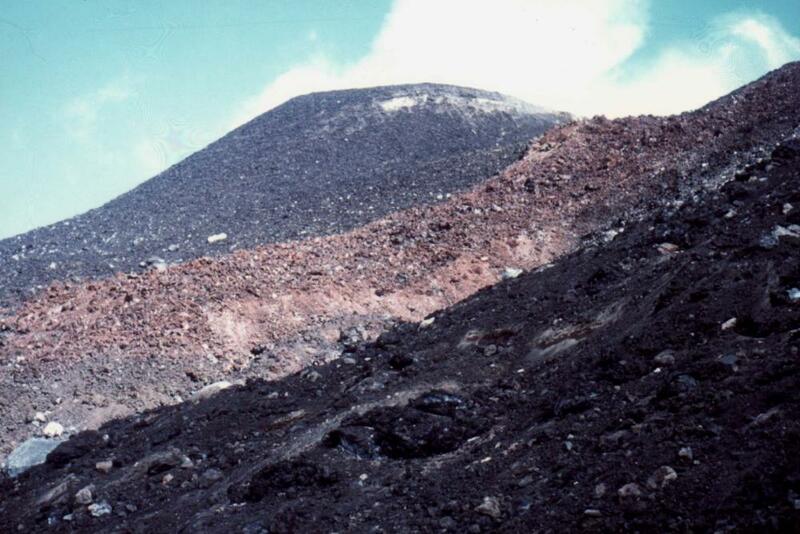 Row of cones visible half way up the slope at left are the uppermost part of the eruptive fissure of 1843. 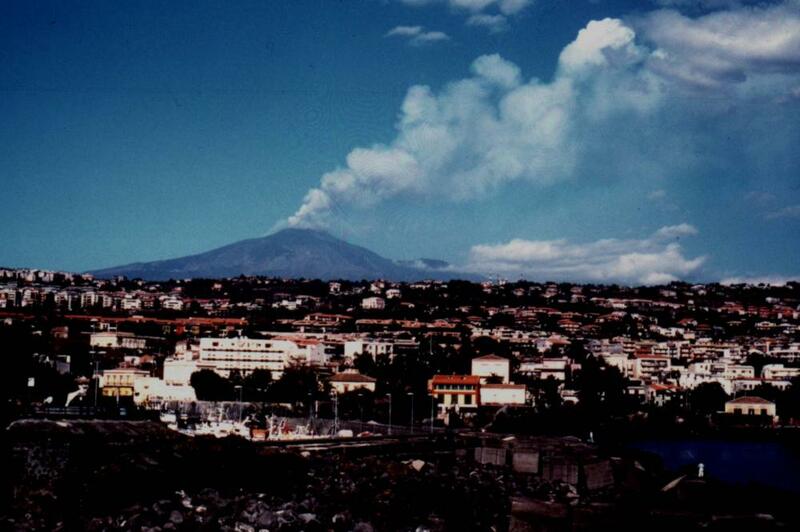 The slight bulge in the slope of the volcano at the skyline at upper left is part of the rim of the Ellittico caldera, a collapse depression formed possibly about 15000 years ago. 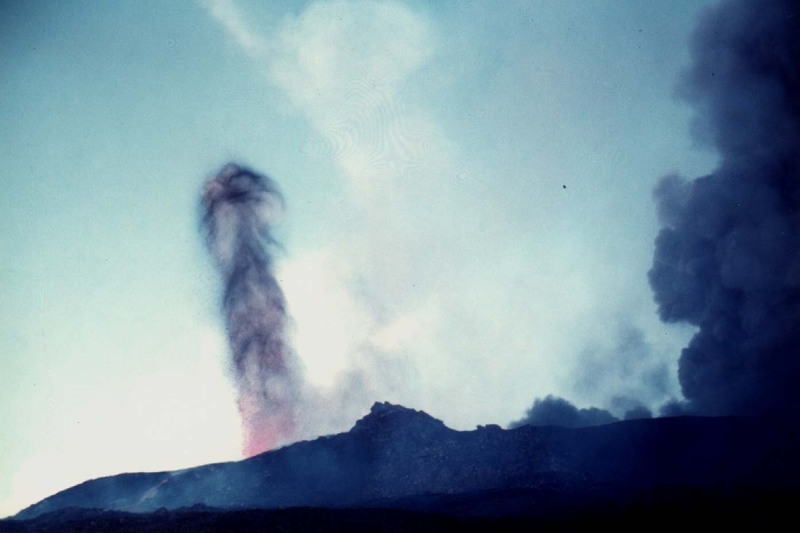 Two eruptive plumes are seen rising from the Bocca Nuova at the summit, the light-colored one at left comes from the NW vent which mainly ejects lava fountains while the ash-laden plume at right rises from the SE vent. 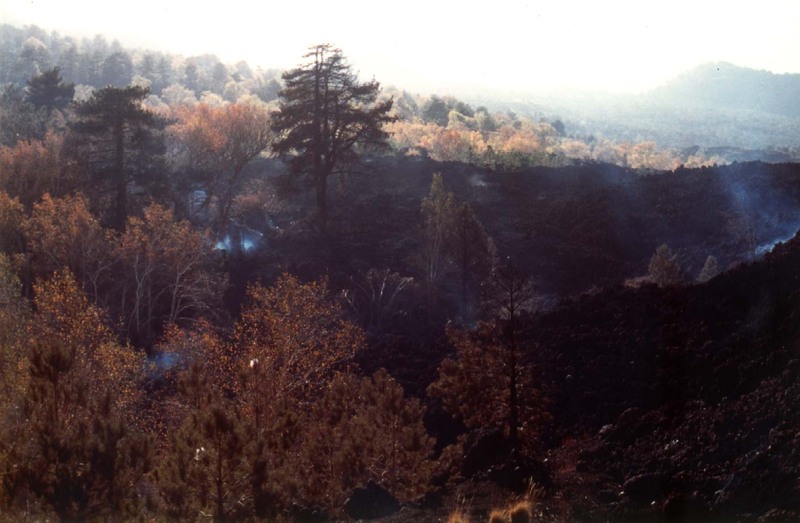 A streak of white gas on the slope immediately below the light-colored left plume marks a minor active lava flow descending a few hundred meters downslope. 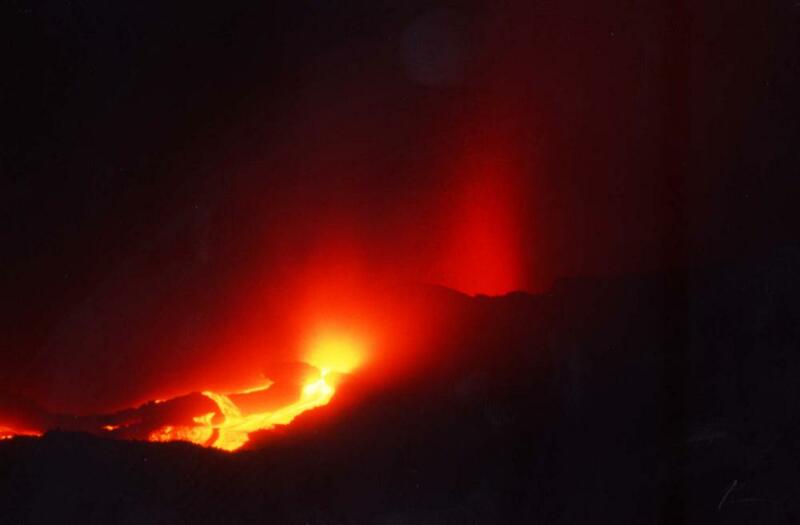 Photo was taken from about half way between Monte Nunziata and the Monte Palestra mountain hut, due W of the summit. 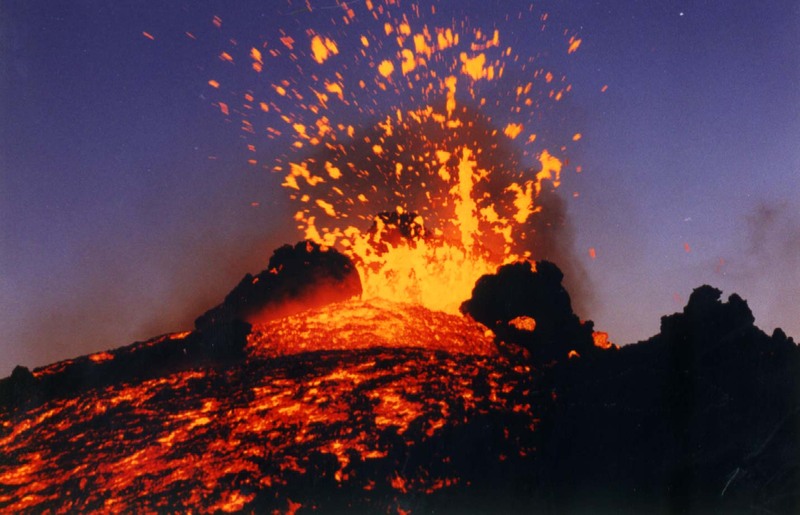 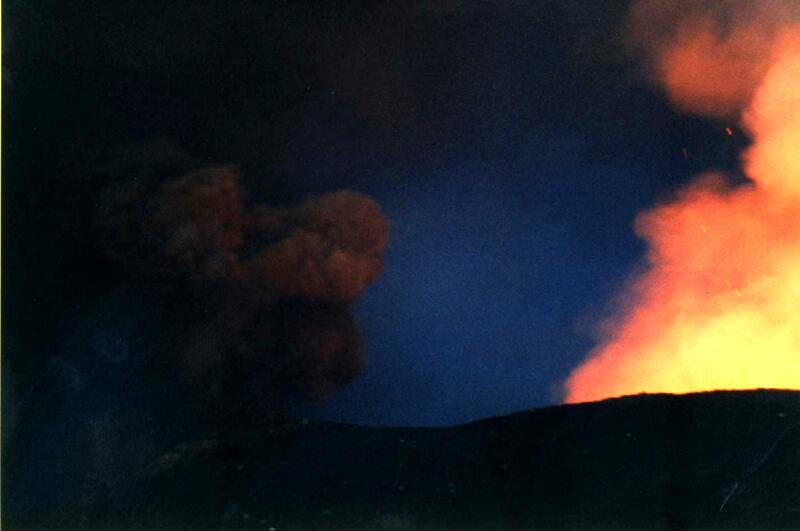 Left and middle: Two photos of the Bocca Nuova in full eruption on the evening of 1 November 1999. 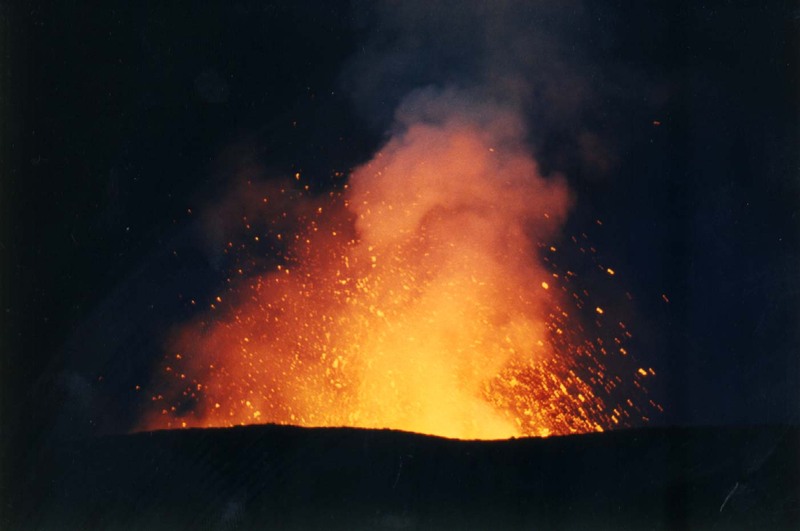 Lava fountains are rising above the NW vent in the crater, and lava flows from a vent a few tens of meters below the W rim of the crater. 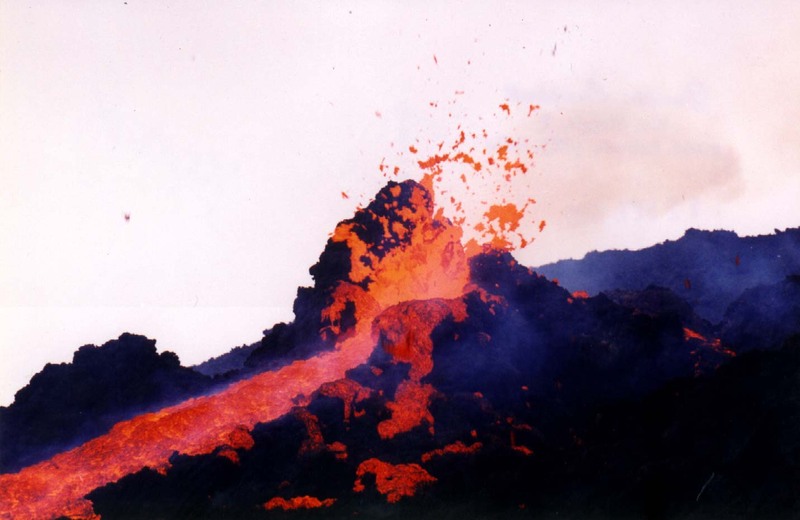 The right photo shows people - volcanologists and photographers - in the foreground; the blurred effect comes from the gas that was emitted by the effusive vent. 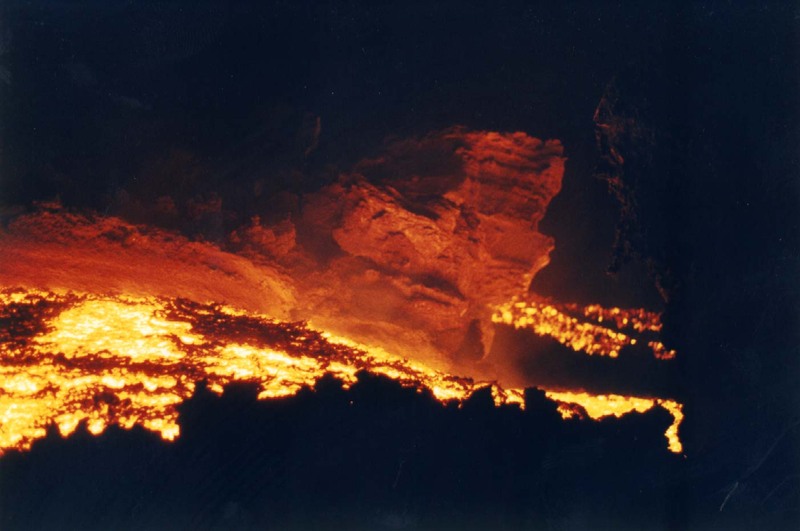 Photo at right: One of the most beautiful shots ever made by Giuseppe Scarpinati: this shows one of the hornitos located on the ESE base of the SE Crater cone spattering vigorously at sunset on 1 November 1999. 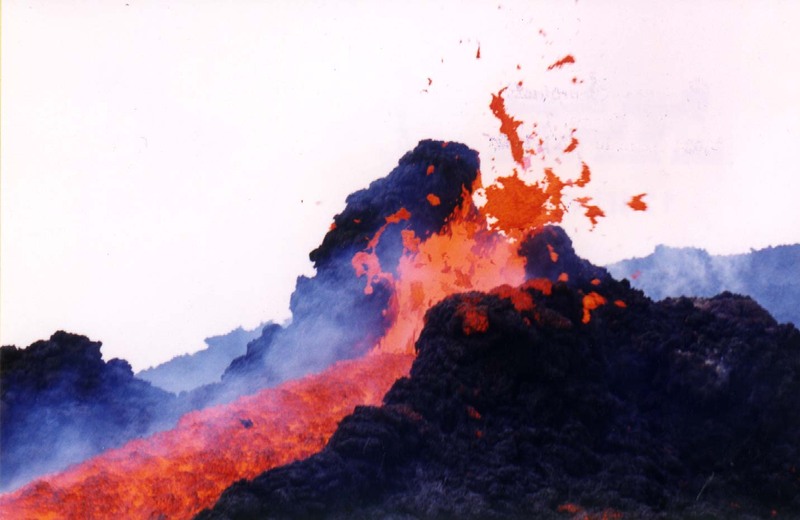 Lava is flowing through a breach on the side of the hornito. 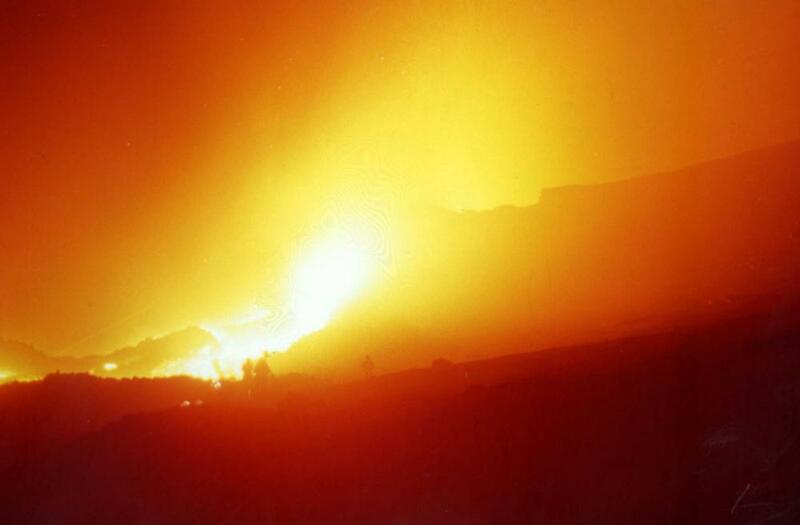 Another hornito, in a state of degassing, is visible in the right background. 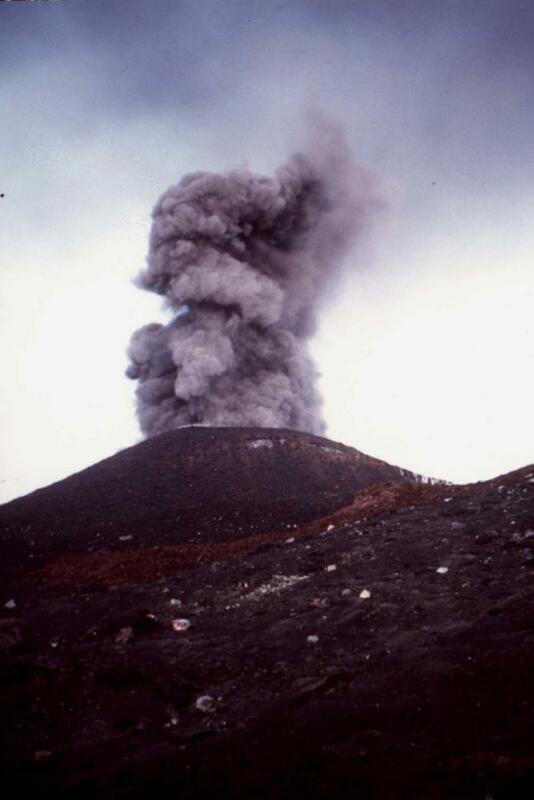 The activity near the SE Crater and at the Bocca Nuova on the evening of 1 November was the final grand show of the period of heightened activity in September-November 1999, although vigorous activity continued for a few days afterwards.